Nutmeg and …The Endocannabinoid System? As readers know, we spend a lot of time researching and writing articles about the endocannabinoid system, the system of cannabinoids, cannabinoid receptors, and enzymes found in most mammals. For a medical cannabis dispensary, this might seem a bit counterintuitive: why not focus purely on cannabis? 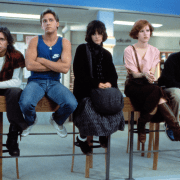 Why not focus the blog on emerging cannabis strains or strain history? Firstly, we take our position as a leading research dispensary seriously. From our intake process to our appointments to the blog, our entire process is designed to go above and beyond what a normal dispensary is equipped to offer. We’re not just concerned with marketing the latest, greatest strains; we’re concerned with your health and your understanding of health. We know that the trust we build with you as a provider is infinitely more valuable than any marketing gimmick. However, secondly, and perhaps more importantly, we understand the potential of the endocannabinoid system. While cannabis represents humanity’s first major interaction and experience with manipulating the endocannabinoid system, it will certainly not be the last. The more we understand about the endocannabinoid system, the more we realize how essential this system is to physical and neurological health. Enter nutmeg. Nutmeg is a spice ground from seeds of the Myristica family of trees indigenous to Indonesia. Like cannabis, nutmeg spice has been used throughout human history for various spiritual, medicinal, and flavoring purposes. Unfortunately, also like cannabis, very little is understood about nutmeg. For instance, while we’ve observed mixed psychedelic effects from excessive nutmeg consumption, we are not absolutely sure what active ingredients are responsible for these effects. 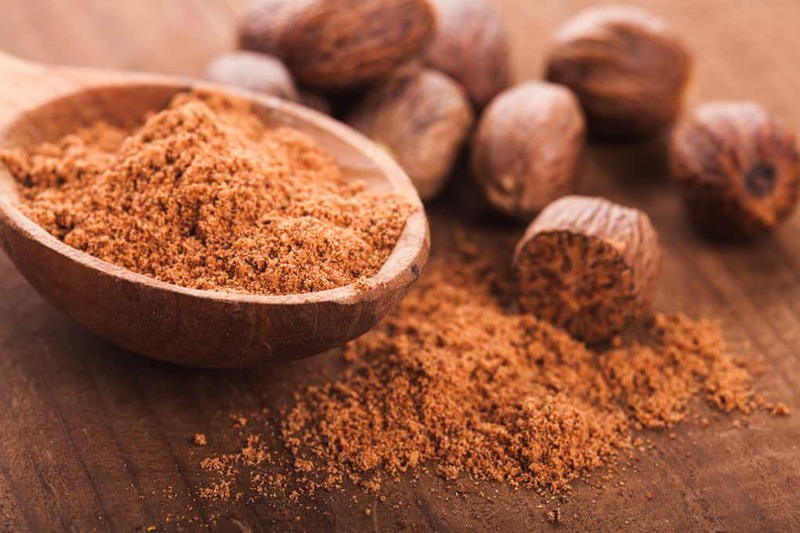 Since the 1960’s, nutmeg has also been abused (although less common) by individuals who consume large amounts of it in hopes of achieving a psychedelic high. This practice is particularly dangerous and can result in fatality or long-term health damage. In contrast, nutmeg used in small amounts as a cooking spice is thought to be entirely safe and harmless. Regardless, between nutmeg’s prevalence and anecdotal use as a psychedelic, we have a genuine need to understand what effects nutmeg-based compounds are capable of producing in the human body. However, researchers are Chicago State University made an interesting observation while trying to characterize nutmeg: some preparations of nutmeg illustrate cannabis-like behavior according to basic behavioral testing in rodents. This obviously lead those researchers to suspect a link to the endocannabinoid system. However, knowing that nutmeg does not bond to cannabinoid receptors directly, researchers began to look for other ways nutmeg might influence the endocannabinoid system. The most obvious initial answer would appear to be that nutmeg is capable of influencing the enzymes that metabolize cannabinoids. As a result, researchers began to test nutmeg extract’s effects on FAAH and MAGL, the enzymes that metabolize cannabinoids and clear them from the receptors they are bonded to. To do this, researchers purchased whole nutmeg seed/kernels and ground these into a fine powder. From there, researchers dissolved the powder in various solvents of increasing polarity. For readers unfamiliar with this process, the basic idea here is that using a single solvent or means of extracting active oils from nutmeg is less likely to absorb all relevant nutmeg oils. Given that the oils dissolve to different degrees depending on their molecular attraction to the particular solvent used, using several solvents (in this case four) ensures that all essential oils are harvested and tested. Inset: Graphs of various inhibitor concentrations vs. FAAH inhibition. In (A), a known FAAH inhibitor was used as a comparison and in (B) and (C), two of the most responsive nutmeg oil extracts were used. 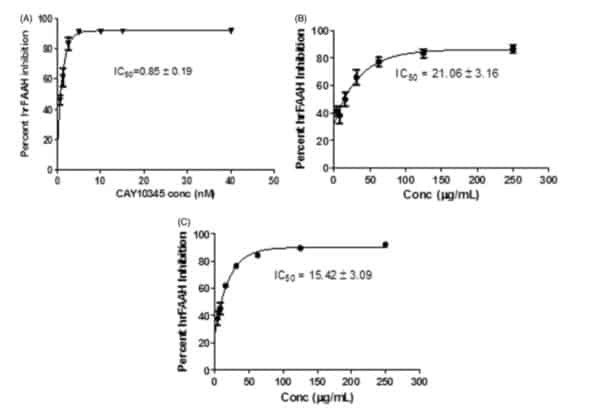 Inset: Graphs of various inhibitor concentrations vs. MAGL inhibition. In (A), a known MAGL inhibitor was used as a comparison and in (B) and (C), two of the most responsive nutmeg oil extracts were used. 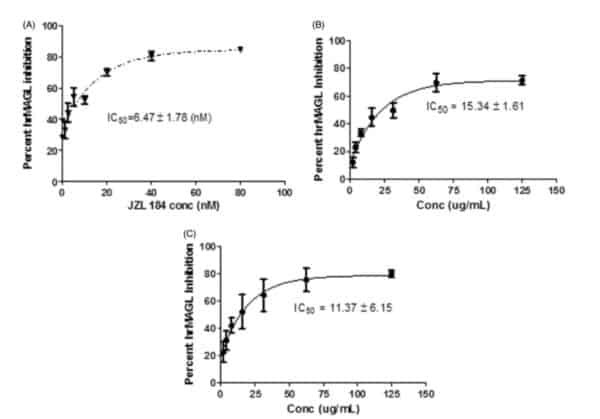 As readers will notice, as concentrations of the nutmeg extracts increase (going from left to right on the graphs), inhibition of FAAH and MAGL also increases (going upward on the graphs). In other words, additional nutmeg oil extract is effectively contributing to the deactivation of these enzymes. As the concentration increases, these effects flat-line at around 75% total inhibition. What does this mean? 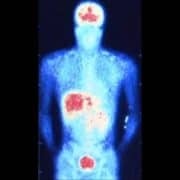 Essentially this proves that nutmeg oil concentrates are capable of affecting and manipulating the endocannabinoid system, which may be where reports of psychoactivity and abuse stem from. Whereas cannabis bonds to cannabinoid receptors directly, nutmeg extract deactivates the enzymes that clear those cannabinoid receptors. Deactivation of endocannabinoid enzymes may lead to the body’s own natural cannabinoids bonding to receptors longer and producing more cannabis-like effects than normally observed. Of course, readers should absolutely not consume nutmeg in the amount needed to observe these effects. Overconsumption of nutmeg remains physiologically dangerous and life-threatening. However, the take-away from this study is something that we’ve been harping on for several years now: cannabis is not the only plant capable of impacting/manipulating the body’s endocannabinoid system. It just happens to be the most obvious and easily observable. It also currently represents the safest and most effective consumer option of activating the endocannabinoid system. Regardless, the discovery of the endocannabinoid system represents an entirely new way of looking at the body and brain. We suspect that in the next twenty years, the number of commercially available medicines based around the effects of the endocannabinoid system will only continue to grow. Abir T. El-alfy, Sharon Joseph, Akshar Brahmbhatt, et al. (2016) Indirect modulation of the endocannabinoid system by specific fractions of nutmeg total extract. Pharmaceutical Biology (2016). DOI: 10.1080/13880209.2016.1194864. https://cornerstonecollective.com/wp-content/uploads/2019/01/10-health-benefits-of-nutmeg.jpg 680 1020 idgadvertising https://cornerstonecollective.com/wp-content/uploads/2019/03/cornerstone-logo-new.png idgadvertising2016-07-13 00:00:002016-07-13 00:00:00Nutmeg and ...The Endocannabinoid System?